total: run 26.5m, ride 150m, swim 19,500 yards. I'll post a few pics when I have a bit more free time. I wrote up a Chilly Willy du race report for the TAF running team blog. The past few days have been jam packed with exciting new things people and places. I prepared for and then presented a Powerstroke clinic in Fort Myers for the Island Coast Triathlon club on Saturday morning. That went well and it was nice to meet some new triathletes. On Saturday night I met my mother in law and her fella out for dinner at Jorge's seafood grill in Clearwater. Try the Amberjack, it was good and you don't see Amberjack on the menu too often. 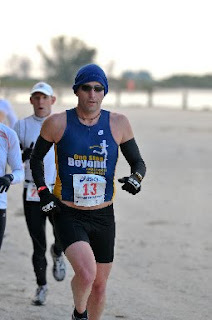 On Sunday I dragged myself out of bed and headed over to Fort Desoto to race in the 6th annual Chilly Willy Duathlon. This is a relatively low key event but it has grown into one of the largest duathlons (if not the largest) in the United States. Fort Desoto is a nice place and the mid-west coast of Florida has a ton of triathletes and runners. They like to get their groove on early in the season. I was pleased with nearly even 5k running splits and a solid bike split on a borrowed bike. Finished 13th overall and 2nd in my age group. This week will be spent burning DVDs for the past clinic, and preparing for one more Powerstroke clinic this weekend here in Cary. I am debating running a local 5k on Saturday morning but I may opt for a long easy run in the park and then a good breakfast somewhere. On Sunday I take off for Florida yet again, and our winter training camp starts Tuesday morning. We are all looking forward to a few days on the beach in FL. I am going to hope it warms up slightly as this winter has been quite brutal here in NC as well as for most of the east coast states. Not much TV or reading lately. I will be blogging only sporadically for the next 3 weeks. Let's all pray for springtime, world peace, financial stability, and a few miracles in Haiti. I am headed down to Fort Myers next weekend to run a Powerstroke clinic and am flying into and out of Tampa. My father in law brought to my attention that on Sunday at Fort Desoto in St Petersburg the Chilly Willy Duathlon is taking place. This is a 5k-10 mile bike-5k. I have just enough time to do the race, ride a bit extra, and then get to the airport, so look for me there. Fort Desoto is a nice place to race. Two weeks after that I'll be running the Gasparilla 15k along the bay in Tampa, and the weekend after that I am running the Belleair Classic 5k. I am taking a two week break from the cold here in NC, first a week at our winter training camp, and then a week of visiting friends and family all around the state before my FIL's wedding on March 6. My tour of Florida (starting March 1) will turn out to be something like Sarasota - Orlando - Ormond Beach - Jacksonville - Orlando - St Pete. If you live in one of these towns and would like to set up a swim lesson, give me a shout through osbmultisport. I will eventually turn some of the information we present in the Powerstroke DVD into an e-book of some sort, but it is low down on my totem pole of Very Important Things to do at the moment. The big project for this year (besides stellar fitness and racing) is a comprehensive training manual that we'll give to our athletes and sell for a nominal fee on the website. With the articles and tidbits I've written over the years it is already a couple hundred pages, just needs a comprehensive edit and organization. Anyway, this article on Powerstroke freestyle swim technique - high elbow catch / early vertical forearm with underwater frame shots describes some of the key technique issues I discuss in the Powerstroke DVD. Since our clinic was snowed out last weekend weekend we are offering a make up Powerstroke clinic on February 20 here in Cary from 1PM to 7PM. I will run this with as few as five people, so if you are interested sign up. In other news, the weather here is looking absolutely dismal today and for tomorrow, which unfortunately is the Krispy Kreme Challenge (2 mile run - eat 12 doughnuts - 2 mile run). Bri and I are not particularly interested in running 4 miles in 30 degree weather with freezing rain pelting us while our stomachs groan under the weight of 12 disgusting fat fried doughnuts, so we're opting out of this particular event. Notice how since the weather is bad the doughnuts are now disgusting and horrible. Does that make me a hypocrite or just complicated and deep? Ha ha. Have a nice weekend. Bri and I are officially signing up for the Erie Canal bike tour in upstate New York in mid-July. This will be our big "summer vacation" for 2010. We both find a lot of joy in going somewhere we've never been, then riding a bike with a group of like-minded explorers through the countryside. At night we check out whichever town we stop in. This particular tour is an eight-day riding tour, but we're going to do just the first six and then head off for the final weekend to do our own thing. 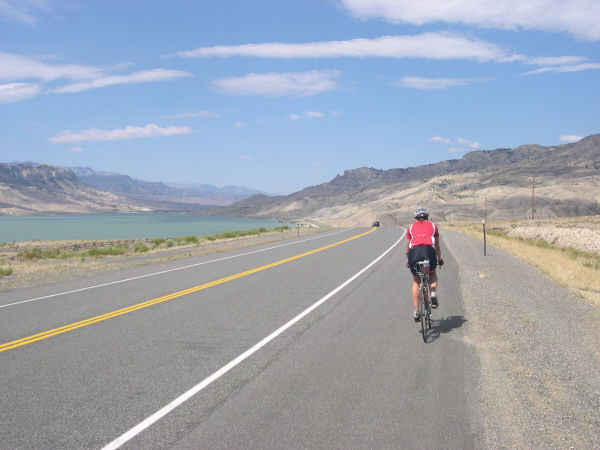 Riding the North Carolina Mountains to Coast bike tour would be a lot of fun as well, but this one falls in late Sep-early Oct, which is not good timing with the various races. Maybe one day.